Then we can see that by moving a magnet past a single loop of wire, a voltage known as and emf (electro-motive force) is induced within the wire loop due to the magnetic field of the magnet. As a voltage is induced across the wire loop, an electrical current in the form of an electron flow starts to flow around the loop generating electricity. But what if instead of a single individual loop of wire as shown, we had many loops wound together on the same former to form a coil of wire, much more voltage and therefore current could be generated for the same amount of magnetic flux. This is because the magnetic flux cuts across more wire producing a greater emf and this is the basic principal of Faraday’s law of electromagnetic induction and an AC generator uses this principal to convert a mechanical energy such as the rotation from a wind turbine or hydro turbine, into electrical energy producing a sinusoidal waveform. There are two basic types of electrical generator and alternator for that matter: the permanent-magnet generator and the wound-field generator with both types consisting of two main parts: the Stator and the Rotor. There are no real advantages and disadvantages of both types. 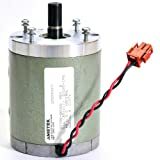 Most residential wind turbine generators on the market use permanent magnets within their turbine generator design, and which creates the required magnetic field with the rotation of the machine, although some do use electromagnetic coils. So the type of wind turbine generator required for a particular location depends upon the energy contained in the wind and the characteristics of the electrical machine itself. All wind turbines have certain characteristics related to wind speed. The generator (or alternator) will not produce output power until its rotational speed is above its cut-in wind speed where the force of the wind on the rotor blades is enough to overcome friction and the rotor blades accelerate enough for the generator to begin producing usable power. Above this cut-in speed, the generator should generate power proportional to the wind speed cubed ( K.V3 ) until it reaches its maximum rated power output as shown. Hi, I’m using a lot of blower fan. is it possible the wind of blower fan use for wind turbin generator ? You could do that but then you are using electricity to create electricity with losses, friction, windage, etc. Hi there iam using leece Neville alternator model 8rl3023c for my home made vertical windmill at my place some time wind follow very high how I can control speed as per requirement .